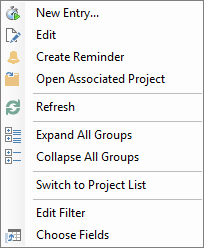 In Outlook 2007, click InLoox Folder in the InLoox PM Toolbar and then Time Tracking in the InLoox PM project list. Click Time Tracking in the tree structure on the left, under Projects. Open a project Choose an entry from the time tracking list and click Open Project in the InLoox PM group. Search for the entries by using a filter In the Current View group, click Filter. To learn how to use the analitycal filter, see Search and find projects, in the Use filters section. Record work times In the Extras group, click Stopwatch. To learn more about the stopwatch, see Record personal time efforts with the stop watch. How to edit the time tracking overview | InLoox PM 8 • Copyright 1999-2019 © InLoox, Inc. All rights reserved.